It was the dreaded morning after Spring Break… oh, it was so hard to get everyone, including myself, moving. We had a good break. What did we do? Nothing really. The boys just seemed very tired from the business of life, school, hockey etc… and seemed to really appreciate the down time of sleeping in, hanging out with no agenda and having friends over. I took this time to purge through each of their closets and get rid of clothes that didn’t fit or just weren’t worn. I cleaned out the boys rooms and moved beds around, finding an abundance of socks under and beside the beds. Add the fact that spring seems to have come early… and it made for a relaxing break. Then the dreaded day before back to school… there is a dullness starting, the unwanted dreariness of preparing lunches, the annoying anticipation of the alarm clock buzzing you out of a blissful slumber… sigh. Monday has come. My blissful slumber was interrupted quite a few times last night. Zachary came into our bed, something he never does, which clued me into the fact that he just needed to be there, even if he didn’t really know why. We have a king size bed. It is enough for Sanj’s man-size body, my body that automatically goes sideways once I am asleep and if needed a little body can be accommodated occasionally. Here’s the thing… that occasionally has become almost every night for Josh. He wakes up and screams a blood curdling scream that sends my body into a frenzy… even though it seems to happen with regularity. The house wakes up. Then there is the “Mommy, I want you.” I lay with him till he goes to sleep then sleep walk back to my bed. Yet… he wakes up a lot. Until I finally bring him back into our bed and then he usually will sleep… although on occasion, he will still have a night terror but we can ward it off as we feel his body tense. Last night with Zach in our bed, I went to Josh’s somewhere in the early hours. It’s a twin. He’s a big boy. He snuggles right into my face. I need space. Much to Sanj’s chagrin, I hate spooning or being wrapped in his arms when I am really ready to sleep. I take position, slightly sideways so our feet are touching and I am off to dream land. Josh doesn’t seem to understand this. So, as his sweet breath fanned my face, I struggled to keep on the bed, ignore the hot flashes and was grateful when I would wake every little bit, that the hands on the clock actually moved, meaning I had experienced some sleep, though it did not feel like it. It was a rough start. The house was a bit of a mess since last night we hung out on our bed and watched a movie together. Then I realized as I puttered home from dropping the boys off that Sammy had an orthodontist appointment at 10:30 am and it was 9:30 am and I had yet to shower. I hate days like this! Tomorrow is a day off to Toronto for Max. Part of me feels this is a pointless appointment because there doesn’t seem to be answers. Yes, Max was a lot better but had started throwing up again… with more frequency… not as bad as before but not as good as it was. Yet getting into Sick Kids was not easy so I feel I need to keep those doors open. It means not getting home till after supper and all that jazz. Funny how this week seemed wide open for me when I last looked! Wednesday I made an appointment with my hair dresser to work some magic… and realized that for some reason my iPhone had “deleted” some of my appointments. This likely happened when the boys were on it… an annoyance. I often want to say they can’t play on my phone anymore yet it is such a diversion for them when I need a moment in public. So Wednesday I have scheduled 3 orthodontist appointments for the other boys. Tonight was one of those nights… you know the ones that play out on a sitcom… I went to the trouble of making Sanj a fancy dinner… just for him (knowing the younger boys wouldn’t likely eat it). 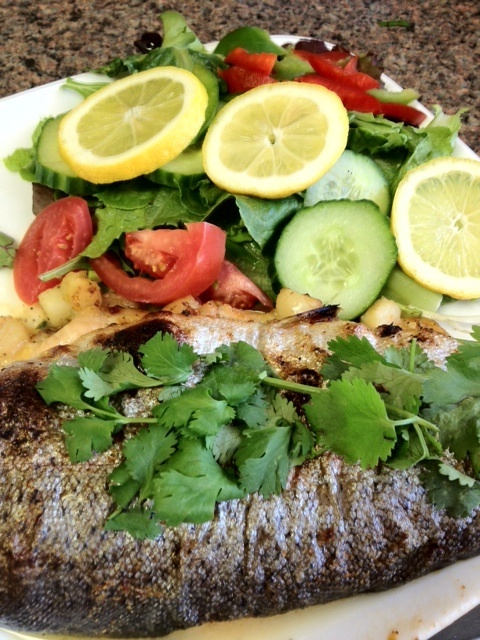 Rainbow trout, whole, stuffed with shrimp and scallops that were sauteed in butter, onions, garlic, seasoned with garlic powder, chili powder, black pepper, salt and some other seasonings… then baked with a salad. All presented in a lovely way. I timed it knowing he would walk in starving. I took it out of the oven. Plated it. Added lemon and garnish. Then waited. And waited. And. Waited. You get the picture right? The candles have burned down to just wax. I am unhappy. Worried first. Then call the office and then mad. His hockey husband stopped by. They were talking. This is where in the sitcom the wife blows the candles off. Dejected… goes to bed. Me… I just get mad. I message him a picture of his dinner and said “I’ve feed it to the kids or the dogs. There’s lettuce for you in the fridge when you get home.” I feel unappreciated. And annoyed. The BBQ knob is stuck and I can’t even feed the boys their supper as I needed the BBQ. (It ended up being really stuck that even my hubby couldn’t open it). He’s lucky that I will forgive him. Well sorta. It’s over the counter rotisserie chicken for him the rest of the week! And lettuce. Then there’s my writing. I’d better get serious. My husband has dished out a lot of money for me… for my two writer workshops and years of listening about my “book” and yet in reality I have changed it so many times that I really don’t have too much concrete to show 🙁 He didn’t look like he believed it was ever going to happen… you know, me becoming a best selling author, making millions with my movie deal and us relaxing more… sunning on beaches… having a full-time housekeeper… meals and laundry a passing memory… OK… I’d better start writing… for real!!! Sigh. There is just so much distraction out there. You know, friends calling for lunch… or going to the gym and then lunch, my projects that are never-ending. It’s SO HARD for me to stay at home alone and write. I get lonely. Maybe I need … OK Sanj… I’m writing!!! This entry was posted in Boys, choices, Family, General, love, Marriage, moments, motherhood, My Book, Parenting, Reema Sukumaran, relationships. Bookmark the permalink.